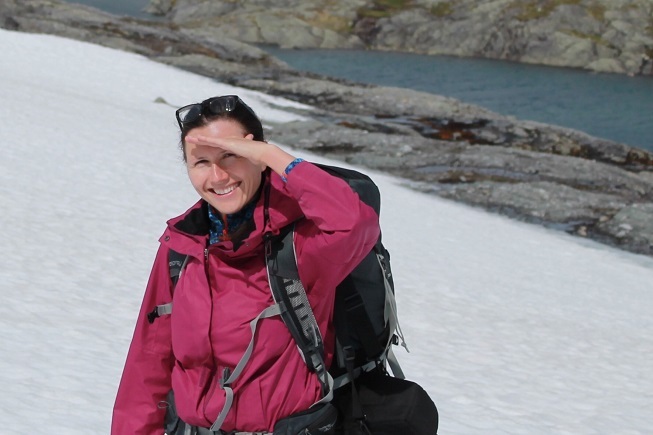 Post-doctoral fellow Svetlana Sorokina from Russia has fallen in love with Bergen. She is currently in her ninth year in the city after arriving as a doctoral student. Svetlana Sorokina is fond of the Norwegian mountains. Shown above on the Hardangervidda mountain plateau. Photo: Private. Dr Sorokina (32) conducts Arctic climate research at the Geophysical Institute at the University of Bergen. From 2008 to 2015 she worked as a doctoral fellow and researcher at the Nansen Environmental and Remote Sensing Center. The seeds to her research career in Norway were planted at an international conference in Russia in 2007, when a representative from the Nansen Center she met told her there were doctoral positions available. I felt that I could realise my potential here and use what I had learned at university in Russia. The focus of the doctoral position was research on the Arctic climate. It was very exciting for me as I had a Master’s degree in meteorology, she says. Svetlana Sorokina completed her Master’s degree at Tomsk State University in 2006. At the time, she knew something about Bergen’s meteorology community but next to nothing about life in Norway. Ms Sorokina arrived in Norway in February 2008. She was initially issued a seven-day visa to travel to Bergen, where she then applied for a residence permit at the police station. The formalities were easy to take care of since the Nansen Center had organised everything for the first part of my stay. They arranged an apartment and provided excellent advice and guidance. The people at both the Nansen Center and the Geophysical Institute made me feel very welcome and my colleagues were great, she explains. She felt welcome from the outset outside her workplace as well, even before she could speak Norwegian. People in the shops were always cheerful and friendly, she says. Dr Sorokina has moved a few times and had no trouble finding a place to stay. While she was a doctoral student, she got the rental flat she wanted each time she showed up for a viewing. Three years ago she purchased her own. Work on her doctorate took more than three years, and the Nansen Center offered her a researcher position to enable her to complete it. After earning her degree and concluding her research period, she was offered a position as a post-doctoral candidate at the Geophysical Institute at the University of Bergen. Moving from a Siberian city in Russia to Bergen in Norway was a big transition. Everything is very different. The biggest difference is the disposition of the people and how they communicate. Russians are hot-tempered, more direct and say what they mean whereas Norwegians are milder and more politically correct. It took some time to tune my social antennae to understand whether people meant what they said or not, she states. She also found the weather to be very different. While Siberia is bitterly cold in the winter and hot in the summer, Bergen is more autumn for twelve months . Bergen’s climate suits me just fine. If I miss the snow or the cold I can go to the mountains or home to visit my mother, she says with a laugh. With her eight years in Norway and a six-year-old daughter, Svetlana Sorokina has become integrated into Norwegian society, and has even begun taking the long treks across the Hardangervidda mountain plateau that are popular among native Norwegians. She finds there are significant differences in the working life of Norwegians, North Americans and Russians. Norwegians, or at least the ones I know, are incredibly hard, concentrated workers. Those who have a family go home at 16:00 because their families are waiting. Norwegian work culture is family-oriented, unlike US work culture, for example, where everyone is more focused on working at top speed the whole time than on family. The Russians, on the other hand, take long breaks, drink tea and make small talk. The pace is much slower, though I believe young Russians today do work hard, she says. Now she is working in an international environment in Bergen. The scientific level of the community in Bergen is first-rate. People from NASA and major universities in the US come to work at institutions in Bergen. Towards the end of my work on my doctorate I had two supervisors from the US, she explains. Dr Sorokina has two more years left in her position as a post-doctoral fellow. Her daughter’s father is Norwegian, so she plans to stay in Norway. From the time I was working on my doctorate I had the feeling that this is where I belong. I am very happy here. I don’t know where I may end up later, but I like working with science communication, for instance by holding lectures at schools and writing popular science articles, she concludes. You have to be passionate about your work. Focus on the research group you would like to join. Contact the group you are interested in to see if it is a good fit for you. Read up on Norway and its culture. Remember that the climate in Bergen is different.